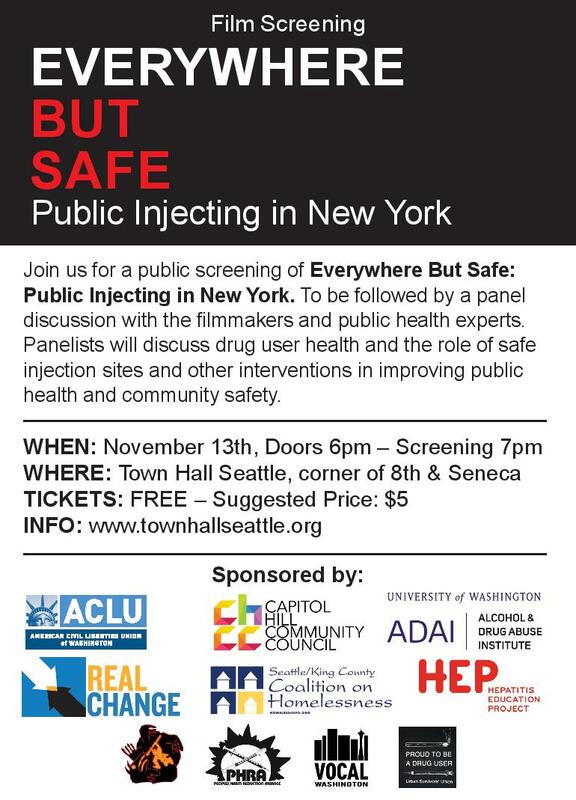 Join us for a public screening of Everywhere But Safe: Public Injecting in New York. To be followed by a panel discussion with the filmmakers and public health experts.Panelists will discuss drug user health and the role of safe injection sites and other interventions in improving public health and community safety. Read more about the event in this Press Release. The event is co-sponsored by the Public Defender Association, VOCAL-WA, ACLU of Washington, Alcohol and Drug Abuse Institute, University of Washington, Hepatitis Education Project, Seattle/King County Coalition on Homelessness, People’s Harm Reduction Alliance, Urban Survivors’ Union, Real Change, and the Capitol Hill Community Council. Speaking at the event will be filmmakers Matt Curtis, MPH and Taeko Frost, MPH, as well Eric Seitz a street outreach public health nurse; Chloe Gale, MSW (REACH); Caleb Banta-Green, PhD (Senior Research Scientist at the Alcohol and Drug Abuse Institute as well as an Affiliate Associate Professor at the School of Public Health, University of Washington); Vivek Chaudhary (long time officer of the Urban Survivors Union, Seattle’s longest standing drug user union); and Shilo Murphy (co-founder and executive director of the People’s Harm Reduction Alliance). The event is open to the public and panelists will be available to speak to the media both before and after.